OXFORD, Miss. — For the second straight weekend, No. 7 Ole Miss took on a ranked opponent from the SEC East. This weekend, the No. 12 Georgia Bulldogs came calling after the Rebels spent the last two weekends on the road vs. Mississippi State and Vanderbilt. Friday nights in conference play are special–a week’s worth of anticipation and pitching ace vs. pitching ace culminate with the opening game of a series. With each team’s top pitcher on the mound, runs are frequently tough to come by, and Friday night against Georgia was no exception. Starting pitching was the story for both teams. 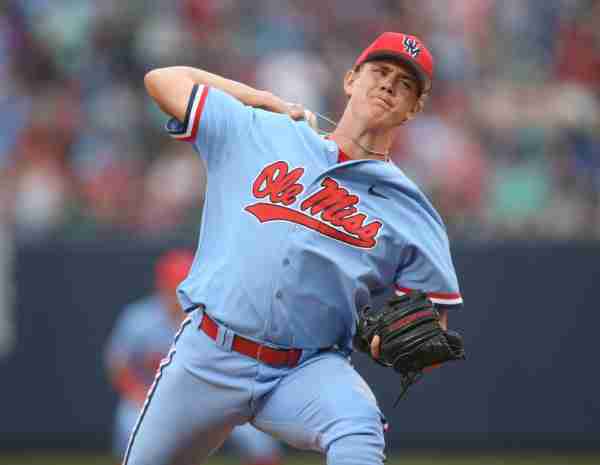 Ole Miss’ Ryan Rolison threw seven strong innings, allowing only two runs and scattering seven hits over the course of his appearance. Given the Rebels’ offensive success thus far this season, one might have expected the home team to emerge victorious; however, that just was not the case in the series opener against the Bulldogs. Outside of the first inning, when Ole Miss loaded the bases with one out, baserunners for the Rebels were tough to come by. The Georgia starter retired Ole Miss hitters in order in the third, fourth, and fifth innings. In the sixth, shortstop Grae Kessinger ignited the crowd with one swing of his bat. His solo home run to left field was Kessinger’s second homer of the week and tied the score at 1-1 after six complete. “He just left it up and over the middle, and I put a good swing on it,” Kessinger said. 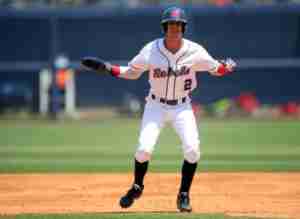 That was the only run the Rebels would manage off the Georgia starter in game one. The Bulldogs and Rebels traded runs in the eighth. 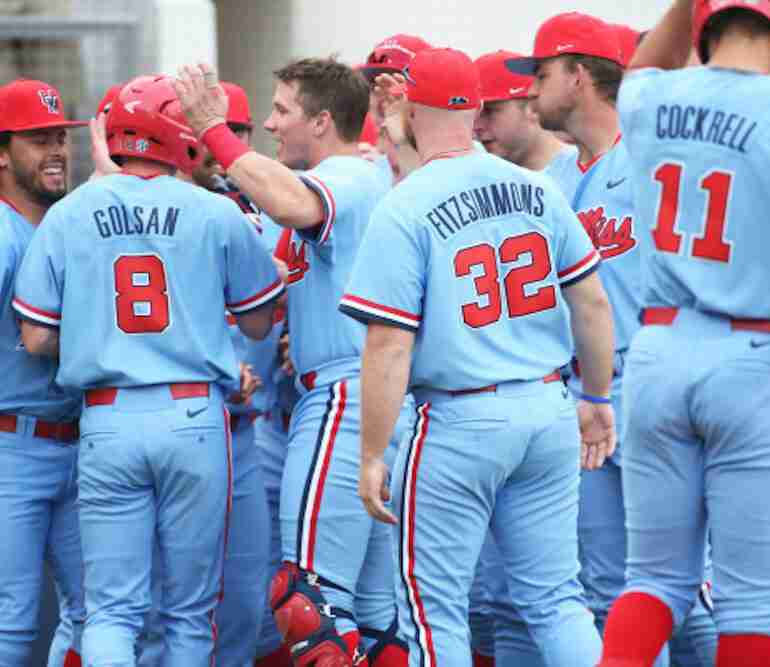 Ole Miss’ runs came from consecutive singles from right fielder Ryan Olenek, catcher Nick Fortes and left fielder Thomas Dillard. With two on and one out, the Rebels stranded both Fortes and Dillard—which would prove to be costly. Olenek’s single extended his team-high hitting streak to 17 games. Unfortunately for the home team and its fans, the 2-2 tie score would be short-lived as Georgia took the lead in the ninth, piecing together a run with a single, walk and a single. 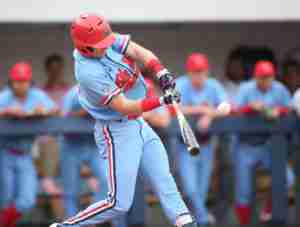 Ole Miss was not able to mount a rally, going quietly in the bottom half of the ninth and losing, 3-2. For the fifth time this year, weekend weather affected the Rebels’ schedule. With a 100% chance of rain forecasted for Oxford on Sunday, Ole Miss made the call Friday to move Sunday’s game to a doubleheader on Saturday. While runs were tough to come by for Ole Miss on Friday, in game two of the series the Rebels experienced tremendous success at the plate. Their efforts were supported by two terrific pitching appearances from junior starter Brady Feigl and senior reliever Will Stokes. 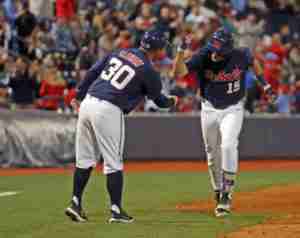 Ole Miss scored one run in each of the fourth and sixth innings and two in the eighth. The big inning, however, came in the fifth as the Rebels tallied four runs. In the fifth, second baseman Jacob Adams got things started with a single. Grae Kessinger followed with a double that plated Adams. Ryan Olenek then brought Kessinger home with a single of his own. Thomas Dillard and Cole Zabowski each walked to load the bases for the Rebels. With two outs, freshman third baseman Tyler Keenan continued his hot streak at the plate and delivered a two-RBI single that gave the Rebels a 5-2 lead. The Rebels manufactured another run in the sixth off two walks and a single from Dillard that gave Ole Miss a 6-3 lead. In the eighth, team captain Will Golsan added insurance runs with a seeing-eye single that scored Nick Fortes and Thomas Dillard and pushed the Ole Miss lead to 8-3. Feigl’s performance was outstanding, and he picked up his team-high seventh win of the season in the process. The Chesterfield, Missouri native pitched 5 ⅓ innings, allowing only two earned runs and seven hits. He gave up three walks and recorded a strikeout in the victory. Will Stokes was strong in relief and allowed Ole Miss to save the bullpen for the second half of the doubleheader. He commanded the mound in his 3 ⅓ innings pitched, giving up just one run and two hits as he earned the save, his first of the year. After the doubleheader, Coach Bianco commented on Stokes’ performance. “(It’s) nice to have that piece back to the bullpen,” he said. Defensively, the Rebels were lifted by outstanding plays from first baseman Cole Zabowski, while, offensively, Olenek extended his hitting streak to 18 games, going 2 for 5 with two singles. Kessinger also went 2 for 5 with two doubles. For the sixth straight SEC weekend, the Rebels entered game three with the series undecided after having split the first two games. Will Golsan was on fire in game three against Georgia. The senior from Columbus hit two home runs and notched three RBIs in the win. He accounted for 60% of the Rebels’ offense and would be the difference in the game. He added a single and recorded a 3 for 4 day. Tyler Keenan also contributed with an RBI double in the second inning, while Ryan Olenek increased his hit streak to 19 games after an infield single in the third inning. The Ole Miss starter for every game three this year has been James McArthur, who again got the call in the rubber game with Georgia. His six innings of shutout baseball were an integral part of the Rebels’ victory in their fourth SEC series win of the year. He allowed only two hits and recorded four strikeouts, en route to improving his record to 5-0 on the season. Parker Caracci picked up the save, throwing 1 ⅓ innings and retiring all four batters he faced. It was his seventh save of the year. “Our bullpen is probably the best in the country and they know that,” commented Will Golsan after the game. “Just had to get their confidence back—they showed it tonight,” he added. Third baseman Tyler Keenan started a terrific double play in the Georgia half of the third. Other defensive gems were turned in by shortstop Grae Kessinger, who made a bare-handed grab and throw to first to retire the leadoff hitter in the fourth; catcher Cooper Johnson, who picked runner off of second base in the fifth; and Ryan Olenek, who recorded an outfield assist on an outstanding throw to the plate that ended the Georgia fifth. Defensively, it doesn’t get much better than throwing a runner out at home from the outfield. Following the doubleheader sweep, the Rebels improve to 32-9 and 10-8 in the conference and are in a tie for first in the SEC West. After the series victory, Coach Bianco relayed the words of wisdom he offered his team. The Rebels will face State for the fourth time this year, playing the Bulldogs in the Governor’s Cup Trophy Game Tuesday at Trustmark Park in Pearl at 6:00 p.m.
Then, the weekend series starts early when the LSU Tigers come to town for a Thursday, Friday, Saturday matchup. Game times are scheduled for 7:00 p.m., 6:30 p.m. and 3:00 p.m., respectively.